With tyre life foremost in everyone’s minds, and lap-time drop-offs reckoned to be up to a staggering four or five seconds near race end, everyone was taking it easy. Well, whatever passes for ‘taking it easy’ at that level, that is. With a track surface older than a lot of the teenagers watching in the stands, grip was at a premium and nobody suffered with this more than Yamaha. 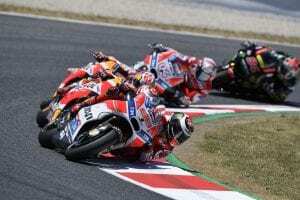 In the race, it was Jorge Lorenzo (who’d stuck it on the front row) that led for a good while, before Marquez, Dani Pedrosa and Andrea Dovisiozo stole past him. Then Jorge went to sleep for a bit, allowing others past too. Rossi had begun well but, as he’d predicted, slumped after 10-laps and would eventually finish the race a very, very distant (and probably extremely pissed off…) eighth place. Worse for Vinales, was tenth and a huge cut from his title points lead down to a mere seven. Ouch! Worse still, was the ignominy of both factory bikes being beaten by both satellite Yamaha machines of Jonas Folger and Johann Zarco – double ouch! Lorenzo, meanwhile, eventually woke up from his fugue state and made his way back up the field to finish fourth. 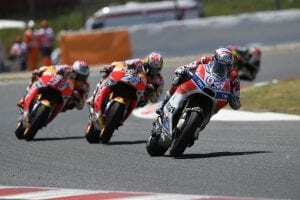 In fact, another lap or two and he’d likely have taken Dani Pedrosa for the final podium spot such was his end of race pace. 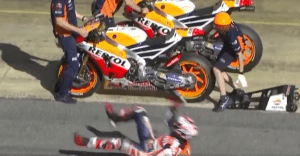 Maybe it was his choice of the harder tyre that spooked him mid-race, but we can only imagine Ducati bosses will be wondering exactly what was going on. Either way, Jorge is starting to click it together inch by inch, bit by bit. As for Yamaha, well, the good news is that most of the next few tracks coming up shouldn’t have low grip quotients, so they shouldn’t suffer in the same way as they did in Barcelona. 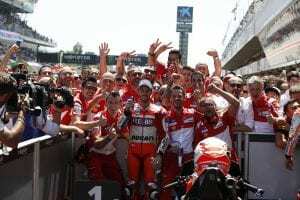 Likewise, unless Ducati and Dovi have turned a serious corner then it may be ‘business as usual’ from Assen onwards. Or maybe not, we guess we’ll see, won’t we? Next Post:New MV Agusta RVS Special Revealed!